Last week, 28 year-old Nicole Allen lost her life in another Vallejo rollover accident. Per the Times Herald, she was traveling west on State Route 37 when she “made an unsafe turning movement” causing her to fishtail and lose control. She hit a concrete divider and her 2009 Infiniti began to roll. Allen, who was not wearing a seatbelt, was ejected from the vehicle and died at the scene. 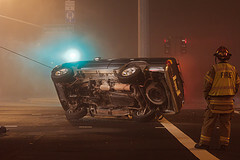 Rollover crashes are one of the deadliest forms of vehicle accidents, according to Safercar.Gov, a webpage produced by the Department of Transportation and the National Highway Traffic Safety Administration (“NHTSA”). Only 2.1% of the nearly 9.1 million collisions in 2010 involved a rollover, but rollovers still claimed more than 7,600 lives and accounted for almost 35% of the year’s traffic deaths. Any vehicle can roll, but the higher center of gravity in tall, narrow vehicles makes them more susceptible to a rollover. When looking at rollovers, the NHTSA divides them into tripped and un-tripped events. Tripped rollovers, which include 95% of all single-vehicle rollovers, occur when a vehicle leaves the road, slide, and either digs into the dirt or strikes a guardrail or curb. The events cause a high tripping force that leads to the roll. A smaller group of un-tripped single-vehicle rollovers usually occur during high-speed accident avoidance attempts and typically involve top-heavy vehicles. Noting that 85% of fatal rollovers are single-vehicle events, the NHTSA suggests that driver behavior is a major factor in rollovers and that these accidents are about the interaction between the driver, the vehicle, the road, and environmental elements. This means that, while it is certainly often the case, one cannot simply assume the driver of the rolled vehicle was at fault. For example, a major pothole, faulty control systems, or even an attempt to avoid a swerving drunk driver are all potential causes. Whether they were the driver of the rolled vehicle, a bystander hit by the rolling vehicle, or other involved party, we serve victims of rollover accidents. If someone else caused a rollover crash in Northern California that left you injured or killed a loved one, call our Vallejo injury attorney. We have offices throughout Northern California to serve your needs and protect your legal rights.